Alaska is home to ten accredited universities and many technical and vocational colleges. With so many schools to pick from, choosing the one that best aligns with your academic and professional interests can be tricky. Prospective students need to consider a variety of factors as they evaluate colleges, including program length, cost, location and scholarship availability. Fortunately, we have applied our rigorous methodology to the latest education data to rank the best colleges in Alaska, including the top four-year and two-year schools. Using statistics from federal education databases, we evaluated various metrics, including each school's acceptance, enrollment, retention and graduation rates. 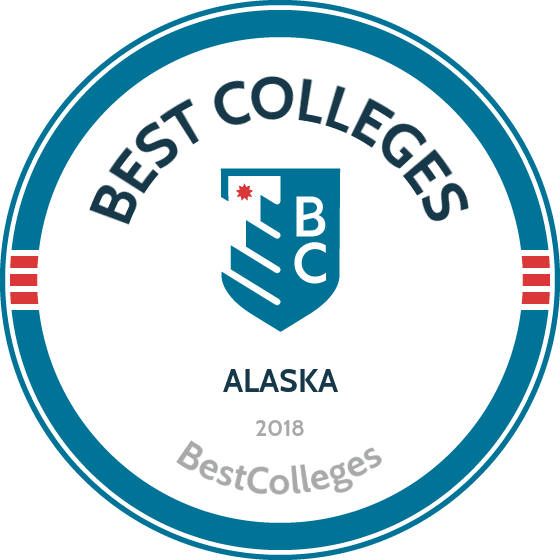 Below, you'll find our list of the best colleges in Alaska. Approximately 40% of Alaskan students enroll in colleges elsewhere, constituting something of a 'brain drain' throughout the state. The shortage of college graduates has led the state to adopt measures supporting postsecondary students, and they're one of only two states to increase spending on higher education per student since the 2008 financial crisis. Alaska increased its higher education budget by 20%, vastly improving the resources available to students and schools. While Alaska's blue collar industries offer ample job opportunities for residents with a high school diploma, most high-paying jobs are limited to applicants with postsecondary degrees. Considering that Alaskans with a bachelor's degree earn 47% more than non-degree holders, it's important to invest in your education. Between the government's expenditures on Alaska's colleges and recent trends on the job market, the higher education climate in the state is very healthy. Below, we've listed all of the four-year schools in Alaska, covering their exploits and academic offerings. UAS is dedicated to the education of traditional undergraduate college students and adults who seek to advance their higher education experience. With three different campuses and eLearning options available, there is no shortage of opportunities for students to earn degrees or certificates in the schools of Arts and Sciences, Education, or Management. UAS also offers career education programs which are designed to meet the occupational needs of Alaska residents. Through short-term training online and in vocational laboratories, students quickly learn job skills that enable them to advance their employment and professional careers. Programs include focuses on diesel, mine mechanics, construction, and fisheries technology, among others. A unique feature offered by UAS is their Come Home to Alaska program, which promotes enrollment in Alaska colleges by offering in-state tuition rates (savings of $13,000 a year) to eligible non-residents who have parents or grandparents living in the state. As a part of the College of Rural and Community Development and central to its mission of providing widespread educational opportunities, UAF has a network of seven different college campuses located across the state to better serve the local residents, as well as several distance learning options. Founded in 1917, UAF is the oldest of all the colleges in Alaska. There are schools for students with a variety of interests, including education, engineering and mines, fisheries and ocean sciences, liberal arts, and management. The university offers education plans for students at all academic levels, from certificates and associate degrees all the way to doctoral degree plans. Perhaps most notably, UAF is a leader in scientific Arctic research, and is one of the only university systems to have earned the “triple crown status” of having earning land, sea, and space grants from the federal government. As the largest of all colleges in Alaska, UA Anchorage has dozens of course offerings for students at all academic levels. There are certificates, associate degrees, bachelor’s degrees, master’s degrees, and doctoral degree options in technical, health, arts, science, education, and engineering fields. Although the center of UA Anchorage is located in the capital city, there are five other branch campuses within the state offering residents a variety of educational support, from academic advising to community college courses. In addition to its degree plans, the university is dedicated to getting students involved at the local level. Students have the opportunity to take part in internship experiences that have a direct impact on their communities, such as on-the-job training at firehouses for emergency services students, or in top-tier restaurants for culinary students. With over 600 students jobs and 800 internships available, the university actively prepares students for successful careers in their home state and beyond. APU offers traditional undergraduate programs in a variety of concentrations. The majority of these are focused on the natural world, such as Earth science, environmental science, marine biology, outdoor studies, and sustainability studies, although there are degree programs and various concentrations available in liberal studies and creative and professional writing as well. Courses at APU often take place both in the traditional classroom setting and out in the field. As a member of the Eco League -- a consortium of six different colleges nationwide with a shared dedication to environmental responsibility -- students have an even wider field of study at their fingertips. For students at APU, up to two non-consecutive semesters can be spent at any of the other Eco League colleges without a change in tuition costs or having to worry about credits transferring. This unique study opportunity makes APU an attractive option among Alaska colleges. Located in Palmer, Alaska Bible College has provided accredited certificate and undergraduate degree programs to religious leaders for more than 50 years. Students choose from one, two, or four-year tracks in bible and Christian ministry studies that build core textual and historical knowledge. Students also receive opportunities for practical ministry experience through workshops, counseling sessions, and other practicums. Degree candidates can pursue a generalist education or specialize in one of five areas of emphasis: children’s ministry, student ministry, pastoral studies, intercultural ministry, and interdisciplinary studies. The specializations provide preparation and work experience for specific careers, while the interdisciplinary track is suited for students with clear professional goals, as it allows them to craft an entirely personalized curriculum. ABC offers a modular course design, in which students finish certain classes in intensive week-long sessions. Students also enjoy one affordable tuition rate, regardless of residency status. Alaska ranks 49th in the nation (29.5%) in the percentage of post-secondary educational degrees awarded to 18-34 year-olds. Alaska's younger workforce is undereducated and an associate degree or technical certificate can separate you from other applicants as you search for gainful employment. Alaska's job market is dominated by the oil and gas, logging and commercial fishing industries. Two-year colleges provide an excellent opportunity for students to gain vocational and technical skills directly applicable to jobs in these fields. Additionally, the Alaska Department of Labor and Workforce Development estimates that 65% of the state's fastest growing well-paying jobs will require some form of postsecondary degree by the year 2020. With those factors in mind, now is the right time to pursue a two-year degree in the state. To help you evaluate the various two-year options in Alaska, we've ranked the state's top programs below. Ilisagvik College in Barrow offers both two-year associate degrees and certificates in vocational, academic, and workforce development fields. Degree programs at the college include concentrations in the arts, accounting and business, allied health, emergency services, and information technology, among others, giving students a solid understanding and knowledge base to either begin their careers or pursue a bachelor's degree after graduation. As the only accredited Alaska Native-controlled institution of higher education in the state, Ilisagvik College is truly unique among the community colleges in Alaska, and its programs are available to local students and distance learners. The college prides itself on modeling courses and activities around traditional culture and values, including an entire program dedicated to Iñupiaq studies. The Ilisagvik campus is located on the Arctic Ocean, giving students the opportunity to spot wildlife such as polar bears in their natural habitat. Located in in the town of Soldotna, ACC is an accredited institution of higher education and a nonprofit organization affiliated with the Evangelical Covenant Church. Guided by a focus on its core Christian values, ACC seeks to empower its students to lead a Christ-like life both within the church and in their careers. The Learning Resource Center on campus holds over 14,000 items to advance and enrich students' academic and religious lives. The two associate degrees available from AAC are in Christian ministry and paraprofessional education. The college also offers a certificate of biblical studies for students who want to advance their knowledge and understanding without pursuing a degree. ACC is a great choice among Alaska community college for those who want to get involved on campus. Extracurricular activities at the school include a student-appointed leadership team, an Eskimo dance team, men and women's basketball teams, and a wide variety of outdoor activities for any weather, including hiking, fishing, snow-shoeing, skiing, and hockey on the school's ice rink. If you're thinking about applying to one of the best colleges in Alaska, continuing reading to learn more about living in the Land of the Midnight Sun. Alaska is nicknamed 'The Last Frontier' for a reason; the state is comprised of 663,268 square miles but contains only 730,000 residents, making it the least densely populated state in the country. Natural beauty and bountiful wilderness characterize the state's landscape, and Alaska is a popular destination for people who love the great outdoors. It isn't just the space and scenery that attracts people to Alaska; the state's 2013 median household income of $72,237 is second best in the nation. Of course, high wages generally follow a high cost of living, and as the 4th most expensive state, Alaska is no exception. These costs stem from the state's isolation, as food, fuel and assorted goods are expensive to acquire. Fortunately, Alaska is the only state without income or sales tax, which helps alleviate the financial burden. To further offset these costs, Alaska's permanent residents are entitled to a yearly stipend of oil and natural resource funds. Known as the Alaska Permanent Fund, residents will receive $2,072 in 2015. Beyond inexpensive tuition, Alaska offers significant benefits to permanent residents. Top perks include access to the Alaska Permanent Fund and discounted hunting and fishing licenses. A condition of establishing residency is that students must prove their intention to make Alaska their permanent home. Proving intent can be difficult, and the state relies on 'customary ties' such as home ownership and employment history to guide their evaluatory process. Minors qualify for residency status if they are the dependent child of an Alaskan resident with a local tax return in the 16 months prior to application, or if they graduated from high school in Alaska in the past 12 months. In order to become a resident of Alaska, you are required to have not claimed residency or paid tuition at an educational institution in another state for two years prior to your residency application. A condition of receiving residency is a required commitment to remaining in Alaska indefinitely. Proof of a commitment consists of either home rental or ownership or employment in Alaska for the past two years.